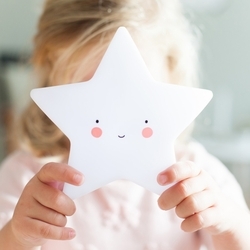 Super cute mini star light! These eco-friendly lights are child safe and made from BPA- and lead-free PVC; and give a soft glow when turned on. You can choose to put the light on, off or on timer. When you switch the timer on, the light turns off automatically after 15 minutes. This saves battery power and is better for the environment! We advise you to use this timer, because the included batteries last for about 20 hours.